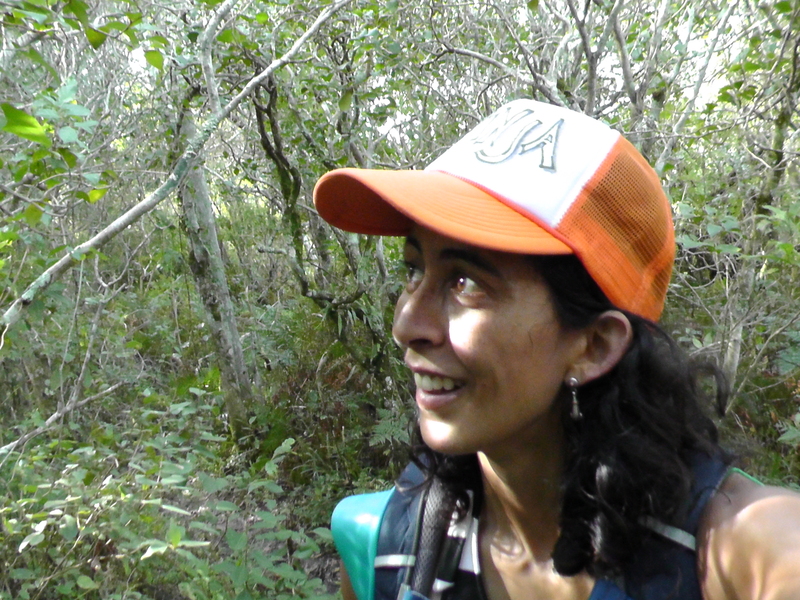 Through the jungle, over the mountain, to the beach | Surfer Grrrls Brazil! Its winter here in Floripa, so not every day is beautiful. We had a long stretch of cold rainy days, which finally came to an end last week. 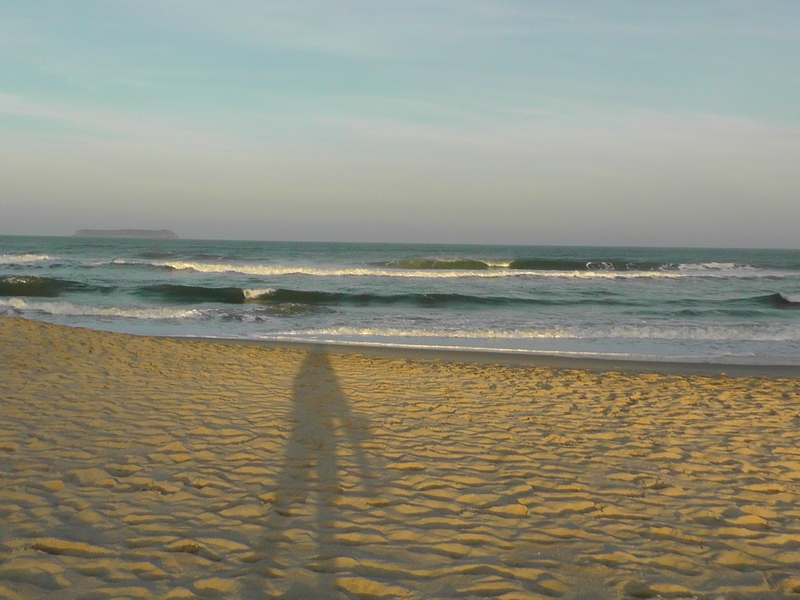 To celebrate, I went on a little surf adventure which soon became epic! 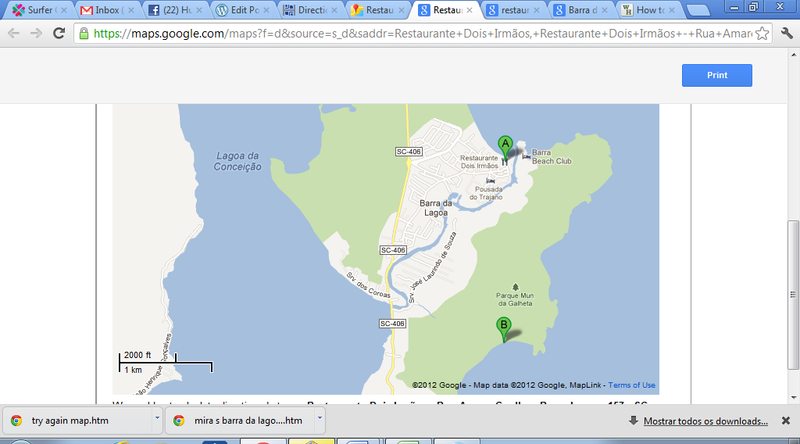 This map shows Barra da Lagoa (A) and Praia da Galheta (B). 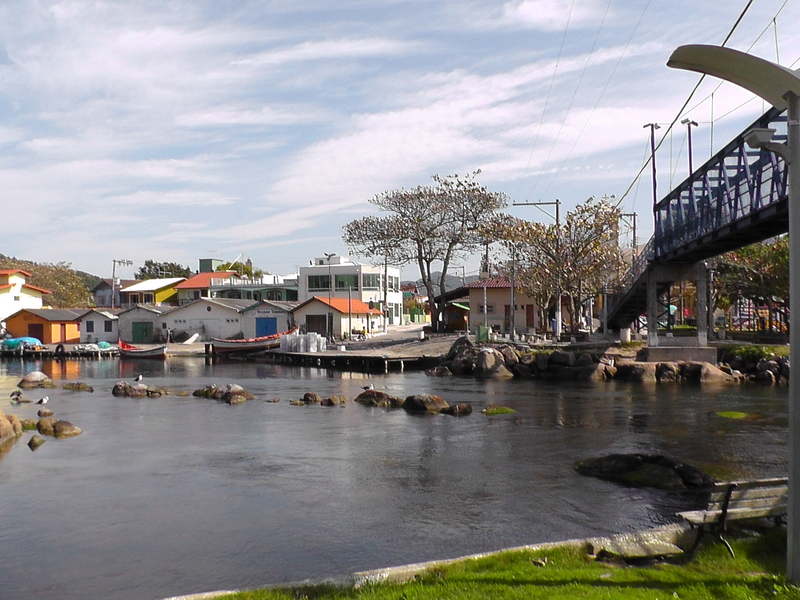 The big body of water to the west is actually a lake, Lagoa Conceicao. (bonitinhos) clomping on and off with their cartoon backpacks and their school uniforms, which, like many things in Brazil, are pretty relaxed – and take the form of a cotton shirt or hoody with the school name. 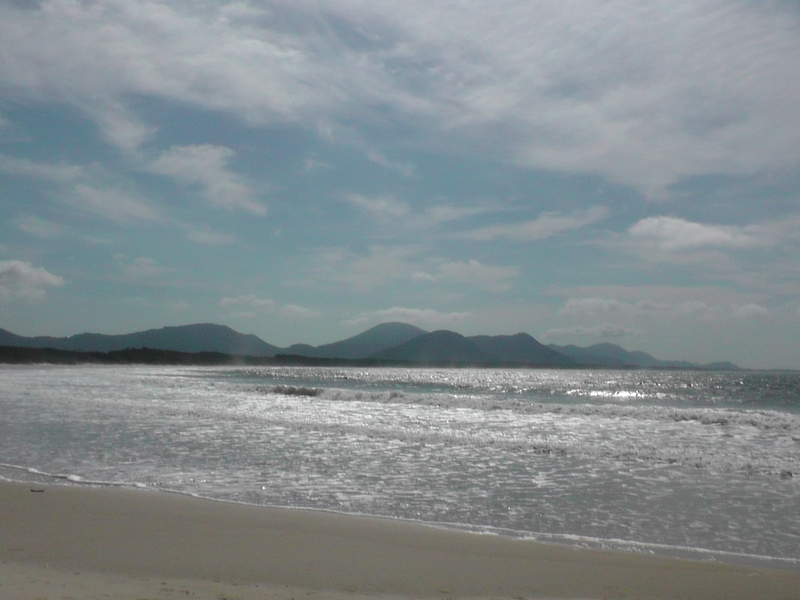 I take the bus to a new beach where I have not yet been, Barra da Lagoa, not sure what I will find. 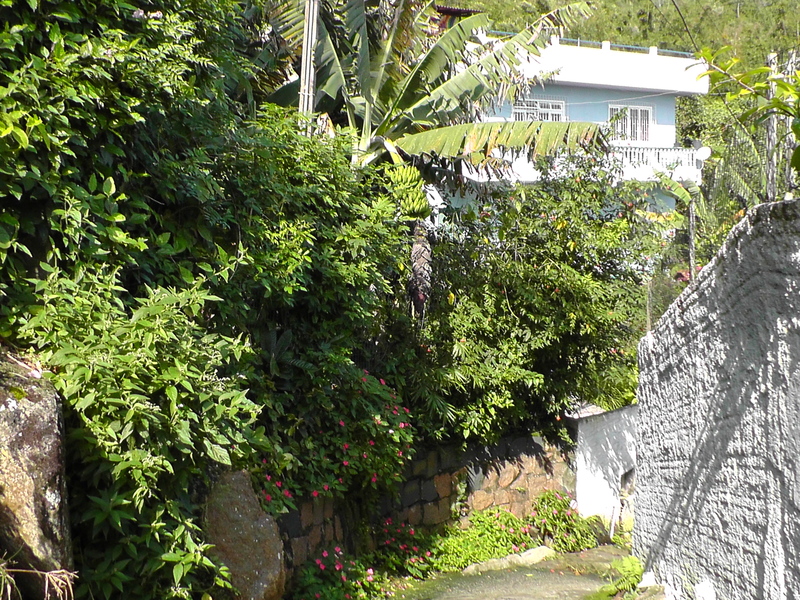 Each beach on this island is surrounded by its own little village with its own special feel. Today I take the bus over the mountain to Lagoa Conceicao, and then over another mountain, along a coastal route that winds in and out of clutttered little villages along the shore until I finally reach Barra da Lagoa. This is a wide open wonderland of sweeping crescent shaped beach, with a vibrant sprawling town of small buildings backing into it — very different than any place I have visited thus far. The big beach looks out on its own collection of little islands, and is lined by open faced restaurants and shops. Brightly colored houses seem to tumble down the forested headlands on the south end of the beach in bougainvilla clad glory. Everything is perfect today except for one thing: my surfing set up is all wrong. The waves are very very tiny. Perfect for a chill day with a big longboard, but not so good for my shorter board. Still its a beach, and the sun is shining, so I am ready to have fun with what I’ve got. This, my friends, is a PENGUIN! he says. 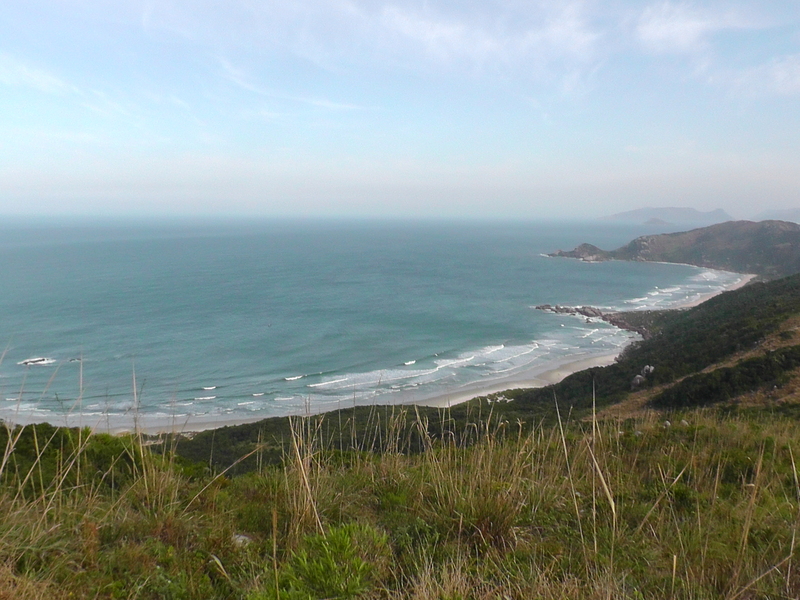 For Praia Galheta, I’d need to walk, but there’s a path over the mountainous headlands. My ears perk up! 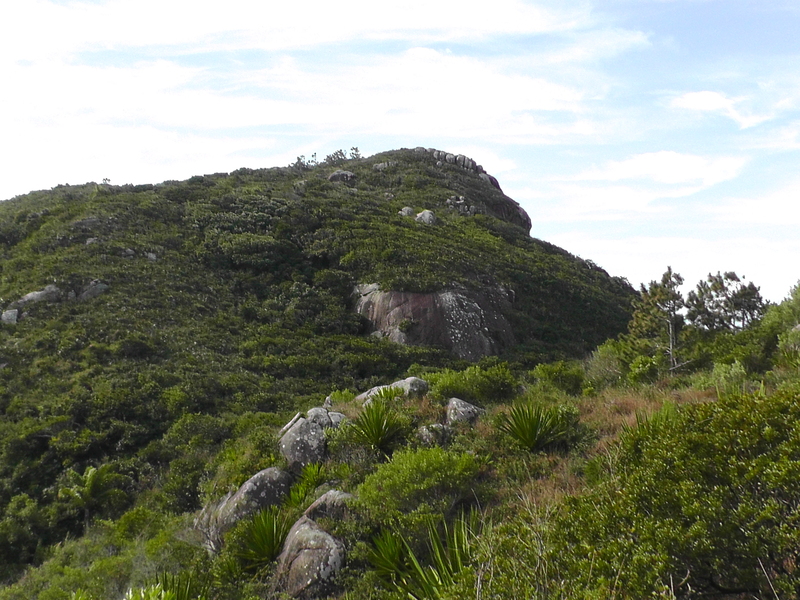 I’d been eyeing those headlands, with their big boulders perched among giant yucca plants way up on the slopes, and had a hankering to explore them. I inquired further. 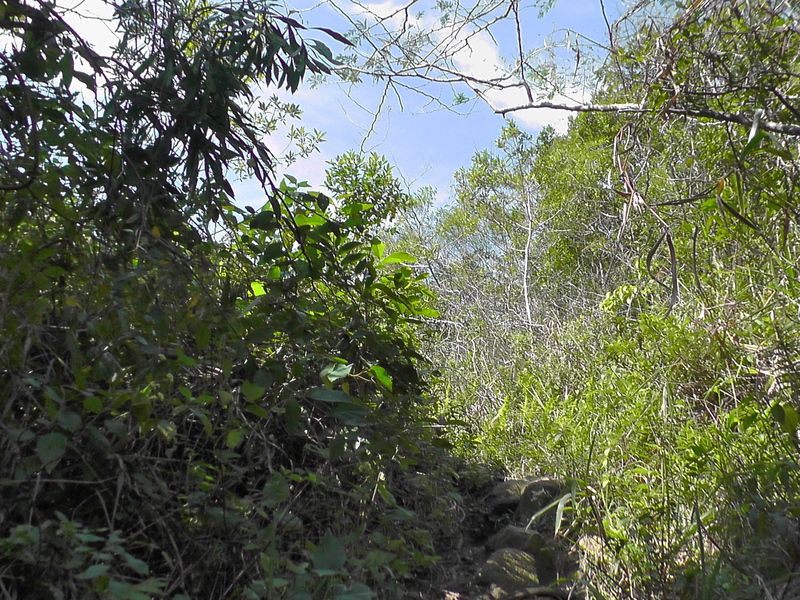 This very relaxed seeming guy told me that the hike would take around 30 minutes, but he couldn’t guarantee the condition of the path due to the recent rain. He gave me further directions in Portuguese and I nodded my head happily though I barely understood. It was a beautiful day, and I’d been cooped up inside for the last few. I was ready for an adevnture, surfboard, unwieldy backpack and all. 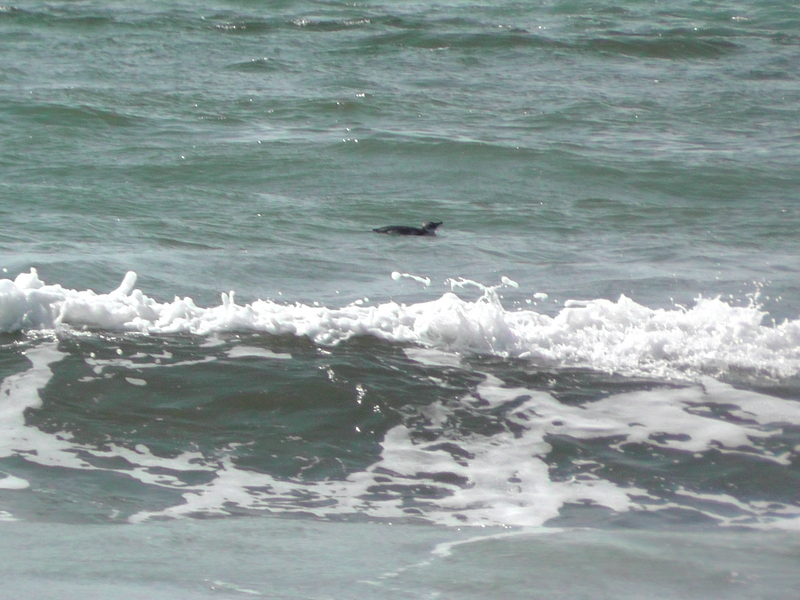 Before leaving the beach, my friendly direction giver pointed out to me that the birds I saw floating on the water were penguins. PENGUINS!!!! I am in the land of penguins. And the water is quite cold. But not, I should note nearly as cold as in San Francisco. Thankfully, as I crossed the bridge, with my huge backpack and surfboard, about to head into the jungle with directions I only partially understood, a Brazilian guy who spoke English asked if I needed help and clarified some of the finer details of the route, warning me against a tempting but potentially disastrous wrong turn I could take that would lead to a treacherous rock path along exposed cliffs. Sounded fun, but not so fun with a surfboard in tow. Go go camera self-timer! Getting sweaty on the way up, but starting to gain some elevation! board, and as I wound my way through the forest, gaining some beautiful views with elevation, the path opened up and took on a more established feel. myself used to the idea that this board would probably suffer a lot of abuse during my trip. No prima-dona boards for me, only rough and ready pirate adventurer surfboards. Appropriately, my board has a pirate printed on the nose! 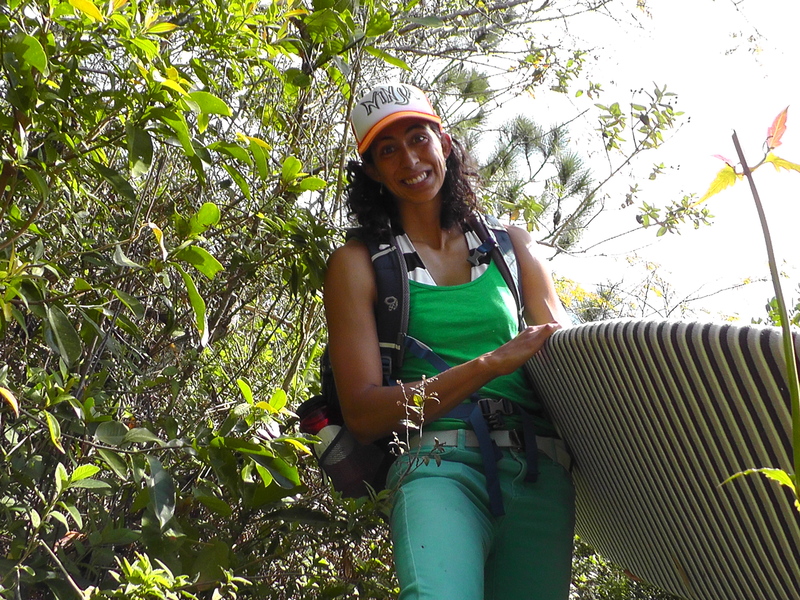 But pretty soon, my surfboard and I were rewarded for our efforts, when we emerged onto a magestic grasscovered ridge trail, high up above the town, and oh what views! 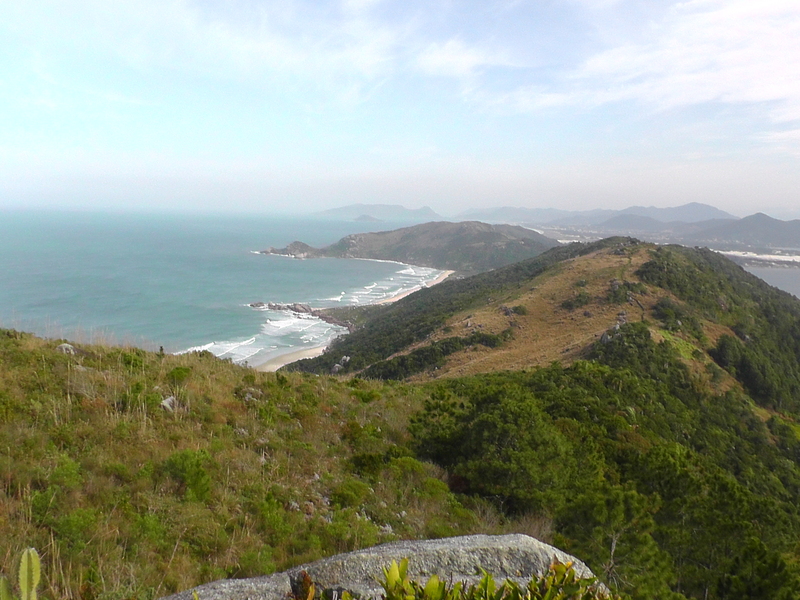 For about 30 minutes I traversed south along the ridge, looking out to the endless blue Atlantic ocean on my left and the vast sleepy valley Lake of Lagoa Conceicao on my right. Then finally I came to a spot where I could see below me the beautiful beach of Galheta – pristine crystal sand, with lapiz blue water, and sets upon sets of perfectly breaking waves! I scurried down the twisting trail through powder soft dunes till I finally landed on the beach, sweaty, mud stained, and extremely happy. 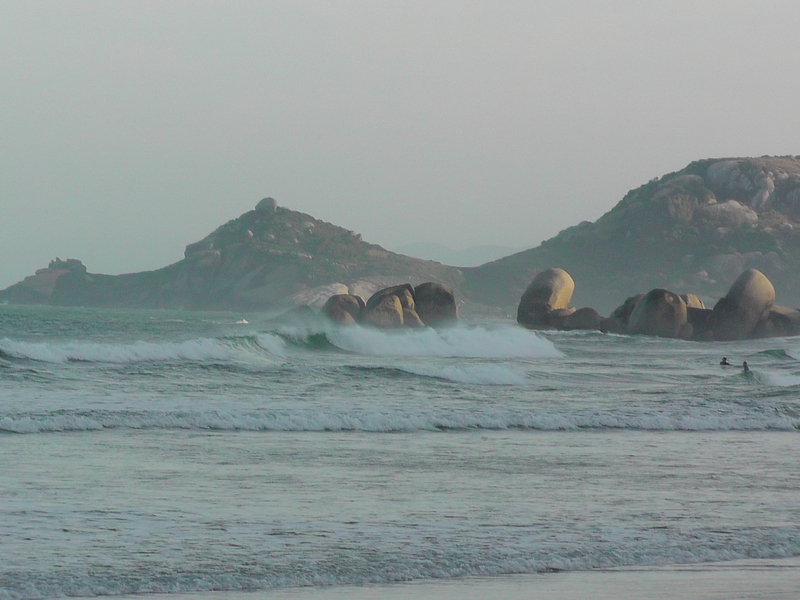 The water was full of surfers – (there is another much shorter route to get there from the adjacent beach, Praia Mole), which was a bit of a relief since I promised my Mom that I wouldn’t go surfing by myself in isolated situations. feeling like a better surfer than I’d ever felt before. My pirate board and I were really bonded now! Oh happiness, you are Galheta on a sunny late afternoon! surfers ran past me into the water to grab a few rides before the sun went down. I picked my way through the short forest trail to the main road, and then hunkered down with my big beatup board waiting for my trusty but slow steed, ye olde Brazilian “onibus” (that’s portuguese for bus) . It didn’t matter that the trail I took that day across the ridge was probably well known to most hikers and surfers on the Island – for me it was the deliciously unexplored Floripan frontier, and I felt like the pirate surf adventurer printed on my new board, who’d ventured off into foreign waters and found myself a mighty trove of treasure. Thank you Brazil!